Benjamin Harrison, 23rd president of the United States and grandson of William Henry Harrison, the ninth president, ran against Democrat Grover Cleveland twice. In 1888, he conducted a successful “front porch” campaign from his home in Indianapolis, losing in the popular vote, but winning in the Electoral College. Four years later, he lost the 1892 election. Harrison generally followed his party’s leadership in domestic matters, but his middle-of-the-road positions on the controversial issues of civil service reform, the tariff, and monetary policy pleased neither reformers nor party regulars. He was more successful with foreign policy. When Harrison moved to his new 16-room house in Indianapolis in the 1870s, he was a prosperous lawyer. The house was his permanent home until his death in 1901. In 1888, he accepted the Republican nomination for president at the house, planned his strategy, and often spoke to crowds assembled on the tree-shaded lawn. On one occasion, admirers celebrating his nomination carried off the picket fence surrounding the yard. Born in 1833 at his grandfather’s estate in North Bend, Ohio, Benjamin Harrison was the great-grandson and namesake of a signer of the Declaration of Independence. Harrison graduated from Miami University, in Oxford, Ohio, in 1852 with distinction. 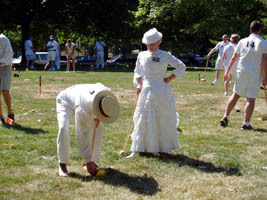 The next year, he married Caroline L. Scott. In 1854, he moved to the growing town of Indianapolis, Indiana, to pursue a legal career. He soon became involved in local politics as a Republican. His law practice prospered, and he moved to a series of residences, each larger and more spacious than the last. In 1867, Harrison purchased a double lot on North Delaware Street, then on the outskirts of the town. In the 1870s, he built a two-story Italianate house with 16 rooms. The large elegant home, a symbol of his success as a lawyer, would be his home for the rest of his life. Harrison organized and commanded a regiment of volunteers during the Civil War. After the war, he resumed his law practice in Indianapolis. He lost his bid for governor, but won election to the United States Senate in 1879, serving until 1887. In 1888, Harrison lost the popular vote in his presidential campaign against incumbent Grover Cleveland by a narrow margin but became president by winning in the Electoral College. Conducted from his Indianapolis home, his successful “front porch” campaign helped him win the key states of Indiana and New York. President Harrison was able to get legislation he wanted passed by Congress and accomplished a number of things during his single term in office. He was proudest of his foreign policy achievements. He presided over the first Pan-American Conference in Washington in 1889, which led to the formation of the Pan-American Union. He helped negotiate international agreements over the status of Samoa and seal hunting in the Bering Sea. He strongly exerted rights of the United States in a bitter dispute with Chile and received an official apology. Harrison believed in civil service reform but made many patronage appointments, removing some of Cleveland’s reform guidelines to do so. At the same time, he increased the number of jobs under the Civil Service Act and appointed a very active Theodore Roosevelt to the Civil Service Commission. Intense disputes over monetary policy and tariffs dominated his administration. In response to demands by farmers and other groups burdened by high debts, the Harrison administration passed the controversial Sherman Silver Purchase Act of 1890, which allowed the Treasury to buy more silver. Debtors hoped that issuing new silver coins would expand the money supply and make it easier for them to pay their debts. In fact, restrictions enacted as part of the legislation prevented any substantial growth in the supply of money. The McKinley Tariff, which raised duties on imports an average of 48 percent, led to a large Treasury surplus and the first billion dollar budget. When critics attacked "the billion-dollar Congress," Speaker Thomas B. Reed replied, "This is a billion-dollar country." Harrison signed substantial appropriation bills, using the money for veterans’ pensions, naval expansion, seacoast fortifications, and a variety of politically popular river and harbor improvements. The high tariff was not popular among farmers and many westerners, who were already turning towards Populism. It contributed to the Republican loss of control of Congress in the elections of 1890. President Harrison also signed the Sherman Anti-Trust Act "to protect trade and commerce against unlawful restraints and monopolies," the first Federal act attempting to regulate trusts. Although created partially in response to growing grievances of farmers and laborers, the Sherman Anti-Trust Act, more often used against organized labor than against monopolies during this period, did little to protect the working class. The Republicans nominated Harrison again in 1892, but Cleveland easily defeated him and the Populist Party candidate, James B. Weaver. Harrison returned to his home in Indianapolis and resumed his law career. Widowed in 1892, only two weeks before the election, he married Mary Dimmick, his first wife’s niece, in 1896. He renovated the house, installed electricity, added the present columned front porch, and redecorated the front parlor. He died in 1901 in the master bedroom on the second floor of the house. He lies buried in the city's Crown Hill Cemetery. In 1937, Harrison's widow sold the house and most of its furnishings to the Arthur Jordan Foundation, which used it as a dormitory for their nearby music school. When the music school moved to Butler University in 1951, the foundation restored the house and opened it to the public. In 1966, it created the President Benjamin Harrison Foundation, which operates the house as a historic house museum. Today visitors can see 10 of the original 16 rooms, restored and furnished with Harrison items and period pieces. Notable furnishings include cut-crystal chandeliers, an original Harrison settee, and an Agra rug from India c. 1870s used in the front parlor. Harrison's library, the room where he planned his 1888 campaign for the presidency, features his massive hand-carved bookcase and numerous other mementos. Furniture from his law office now occupies a third-floor room. The master bedroom contains a huge hand-carved bed, and an exercise machine. In the nursery is a cradle originally owned by William Henry Harrison, Benjamin's grandfather and ninth president of the United States. The original 1888 wallpaper patterns of the front parlor, back parlor, and library are currently being recreated. 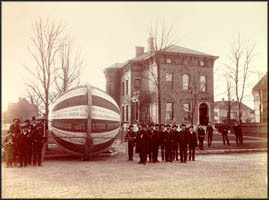 The Benjamin Harrison Home located at 1230 North Delaware St., Indianapolis, IN is a National Historic Landmark. Click here for the National Historic Landmark registration file: text and photos. The Benjamin Harrison Home is open Monday-Saturday from 10:00am to 3:30pm and on Sundays in June and July from 12:30pm to 3:30pm. Tours are offered on the half hour and several exhibits are on display. The house is closed for all major holidays. For more information visit President Benjamin Harrison Home website or call 317-631-1888. The Benjamin Harrison Home has been documented by the National Park Service’s Historic American Buildings Survey. 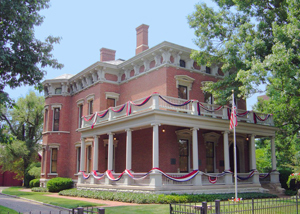 The Benjamin Harrison Home is also featured in the National Park Service Indianapolis Travel Itinerary as part of the Northside Historic District.